And not really an accident either. If you take secular stagnation seriously, as you should, then we have a chronic problem of too much saving chasing too few good investment opportunities, which means that you only feel prosperous when money thinks it has found more good places to go than it really has — and soon enough figures that out, with nasty effects. Turn that into a coherent economic argument, and I'll give you a prize. What's a Central Bank Good For? Mr. Kocherlakota’s outspoken advocacy for stronger action is particularly striking because he spent his first three years at the Minneapolis Fed, after his appointment in 2009, loudly arguing that the Fed should do less. It also represents a sharp break from the Minneapolis Fed’s longstanding association with economists who contend that monetary policy lacks the power to reduce unemployment. That's correct, but it might lead you to think that everyone who works or has worked for the Minneapolis Fed thinks that monetary policy is irrelevant. If you analyzed all of the research coming out of the Minneapolis Fed for the last 40 years, I don't think you would find it any more representative of that view than what you see in the economics profession at large. Of course there were prominent people in Minneapolis - Prescott being the standout - who pushed that view. But anyone who has been around the Minneapolis Fed knows that the people in that place take nothing for granted. Certainly Prescott's view of the world is not taken as religion on the premises. Mr. Kocherlakota’s shift has surprised and dismayed some people at the Minneapolis Fed and economists who supported his appointment because they expected him to be a principled opponent of the Fed’s stimulus campaign. I don't think the potential policy positions of Kocherlakota were a concern of anyone who cared about who the replacement for Gary Stern would be. Within the institution, as in any research institution, people I think were concerned about having a leader in place who understood research and the role it could play in policy. Much work had gone into building a top notch research institution in Minneapolis, beginning in the early 1970s, and everyone who contributed to that effort seemed interested in furthering the tradition. Kocherlakota was chosen by the Board of Directors of the Minneapolis Fed, but I think the views of researchers in the institution played an important role in the choice. And I don't think there were litmus tests about policy views that went into that determination. In October, Mr. Kocherlakota fired Patrick J. Kehoe, an economics professor at the University of Minnesota, from his position as a monetary policy adviser at the Minneapolis Fed. Another Fed adviser, Ellen R. McGrattan, was given a new position as a consultant. Both Professor Kehoe and Ms. McGrattan are proponents of the view that monetary policy has little power to lift an economy from recession. That last sentence is incorrect. Factually, it's hard to nail Kehoe as a proponent of monetary policy neutrality, as I argued here. This also gives the impression that the disagreements with Kehoe and McGrattan were based on policy. As far as I can tell, that's wrong. So, my guess is that, when you read that, you're wondering what kind of lunatic this Prescott is. I've known Ed for long enough to know that he's a very deep thinker, and a serious scientist. He also loves to be provocative. So, what could Prescott be thinking when he says the Fed is irrelevant? Let me play devil's advocate, and argue Prescott's point. The U.S. has had a central bank only since 1914, but somehow managed to surpass the U.K. - the home of the first central bank, established in the 1694 - in terms of per capita income sometime during the 19th century. But maybe you think that the Fed was important as an institution for eliminating or at least mitigating the effects of financial panics, which occurred repeatedly in the U.S. after the Civil War and before the Federal Reserve Act was passed? On this, Canada is an important counterexample. There was no Canadian central bank until 1935, but Canada managed to avoid the financial panics that occurred in the U.S. in the 19th century. Thus, it appears that central banking is not necessary for development, nor does it appear to be necessary to prevent panics. What about the Great Depression? Friedman and Schwartz thought that the Fed's behavior during that period was important, at least in propagating the Great Depression. But in Kehoe and Prescott's book, Hal Cole and Lee Ohanian make the case that we can make sense of the Great Depression without thinking much about monetary factors, or banking, for that matter. Again, if we were to view central banking as the key to preventing banking crises, obviously the presence of the central bank didn't prevent 1/3 of U.S. banks from failing in 1933, and Canada sailed through the early part of the Great Depression with no central bank, and no bank failures. In terms of aggregate fluctuations, it was once thought that a cursory look at the time series showed the benefits of stabilization policy - clearly post-WWII volatility in real GDP was much smaller than pre-Great Depression real GDP. But Christina Romer's work called that into question. If you do the measurement in a different way, it's not so clear. In more recent times, we all know about the Great Moderation, which was supposed to have been a great victory for monetary policy, but was followed by the immoderate recession of 2008-09. If we look at what explains the differences in levels of per capita income across countries, I don't think anyone argues that central banking is an important factor. But there is plenty of work ascribing the dispersion in standards of living in the world to misallocation in factors of production, human capital, productivity at the firm level, political factors, and property rights. Ross Levine makes the case that financial factors are important for economic growth (poor financial arrangements could be part of what the factor misallocation comes from), but it's not clear what link might exist between central banking and general financial health. So, I don't want to put words in Prescott's mouth, but that's the case he might make. On the other side of the argument, we have Friedman and Schwartz's monetary history, and a wealth of other empirical evidence aimed at showing that monetary policy matters. I think there are few macroeconomists who would argue that short-run nonneutralities of money are non-existent, though many of them would give you an argument about the wisdom of exploiting those nonneutralities. Further, in spite of the fact that some countries functioned well in the past without central banking, in the complicated world of modern finance, it's possible these institutions are critical. Friedman was of course a big advocate of laissez-faire, but not in monetary arrangements - he thought the government should be the monopoly supplier of currency, and that the central bank had an important role to play. We may now consider some of his monetary policy prescriptions wrongheaded, but if Friedman were alive and were Prescott's colleague, he would be giving him a hard time over lunch. In any case, we should not be dismissive of what Prescott is saying. We need to think carefully about what our central banks are good for. Perhaps central bankers, and the public, have been taking the role of monetary policy too seriously. One can certainly make a case, as I have, that the Fed has recently been inclined to confidently leap into unknown territory, with too little thought for the consequences. Ben Bernanke will chair his last FOMC meeting this week, and will depart from the Board of Governors on January 31. So, the time is right to look back on his 8 years on the job, and ask what he's accomplished, and how central banking has and has not changed under his leadership. When Bernanke began his first term in 2006, I think the big change people expected was an inflation targeting regime for US monetary policy, similar to what exists in New Zealand, Canada, or the U.K., for example. While that may have been in the cards, by the time Bernanke was up to speed in the job, events had overtaken him, and he clearly ended up with much more than he bargained for. In terms of how Fed officials think about their jobs, and how the public thinks about the role of the central bank, the Fed's objectives and its toolbox are far different from what existed, or was envisioned, in 2006. It will take us many years to sort out what happened during the financial crisis, and why. We don't even have all the facts yet, and I'm sure there will be important revelations when the principals (hopefully including Bernanke) write about it. For starters, it is useful to read the Q and A from this recent Brookings conference. MR. AHAMED: You've said somewhere that the playbook that you relied on was essentially given by a British economist in the 1860s, Walter Bagehot. And his dictum was that in a financial crisis, the Central Bank should lend unlimited amounts to solvent institutions against good collateral at a penalty rate. How useful in practice was that rule in guiding you? 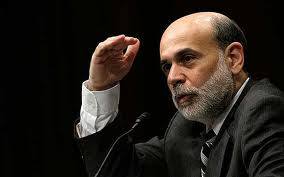 MR. BERNANKE: It was excellent advice. This was the advice that's been used by Central Banks going back to at least the 1700s. When you have a market or a financial system that is short of liquidity and there's a lack of confidence, a panic; then the Central Bank is the lender of last resort. It's the institution that can provide the cash liquidity to calm the panic and to make sure that depositors and other short-term lenders are able to get their money. In the context of the crisis of 2008, the main difference was that the financial system that we have today obviously looked very different in its details, if not in its conceptual structure, from what Walter Bagehot saw in the 19th century. And so the challenge for us at the Fed was to adapt Bagehot's advice to the context of a modern financial system. So for example, instead of having retail depositors lining out, you know, standing in line out the doors as was the case in the 1907 panic, for example, in the United States; we had instead runs by wholesale short-term lenders like repo lenders or commercial-paper lenders, and we had to find ways to essentially provide liquidity to stop those runs. So it was a different institutional context, but very much an approach that was entirely consistent I think with Bagehot's recommendations. I have often seen Bagehot's name mentioned in discussions of the financial crisis, but I think the idea that what the Fed did during this recent episode is "entirely consistent with Bagehot's recommendations," is entirely wrong. As Bernanke points out, Bagehot lived in an entirely different economic environment. In 1873, when Bagehot published Lombard Street, the Bank of England operated under Peel's Bank Act of 1844, which gave the Bank of England a monopoly on the issue of currency in the UK (except for some grandfathering). The U.K. operated under a gold standard, and part of the stock of Bank of England notes had to be backed 100% by gold. There was also a "fiduciary" component to the note issue, not backed by gold, and in practice this was a substantial fraction of the outstanding notes - sometimes a majority. Banking panics during Bagehot's time were effectively flights from the liabilities of private financial intermediaries to gold and Bank of England notes. Bagehot's recommendation was to stem such panics through unlimited lending to private banks by the Bank of England against good collateral, at a penalty rate. Why the penalty rate? Bagehot appeared to be concerned with protecting the gold reserves of the Bank of England, and seemed to think the high penalty rate on lending would be an efficient way of limited lending. But was central bank lending actually an important part of the response to panics that occurred during the 19th century in the UK? Possibly not. The key problem during these panics was a shortage of media of exchange, so the best response of the Bank of England would have been what would get more Bank of England notes into circulation, the stock of gold being essentially fixed. During the panics of 1847, 1857, and 1866, which occurred after Peel's Bank Act and before Bagehot published his book, Parliament acted to suspend the Bank Act, which permitted an expansion in the Bank of England's fiduciary issue of notes. Whether the notes got into circulation through lending or asset purchases by the Bank of England does not particularly matter, I think. Thus, whether Bagehot's prescriptions were actually an important part of a crisis response during his own time is subject to some doubt. More to the point, it is very hard to say that any important intervention by the Fed during the financial crisis looks much like what Bagehot recommended. For example, a very large lending program was carried out using the Term Auction Facility (TAF), under which lending peaked at about $480 billion in March 2009. It seems the rationale for this program was the reluctance of financial institutions to borrow due to the "stigma" associated with standard discount window lending. Under the TAF, the Fed chose a quantity of funds to lend, then auctioned this off. That's hardly unlimited lending at a penalty rate. So, I think it would be useful if we declared a moratorium on the use of Bagehot's name, in instances where the name is only being used to lend credence to some contemporary idea. We could probably make a case to do the same for Wicksell, Minsky, and Keynes, for that matter. It's common, I think, to rate Bernanke highly for his performance during the financial crisis. Of course, it's important to analyze carefully the Fed's behavior in 2007-2009, and to be critical, so that we don't repeat mistakes, if there were any. For example, consider the follwing. An interesting idea is that moral hazard associated with too-big-to-fail is not only a long-term problem, but a problem that can present itself in the context of a crisis. For example, the Fed played a very important role in the Bear Sterns collapse. The Fed lent to Bear Stearns just prior to the collapse in March 2008, and helped engineer its sale to JP Morgan Chase by taking some of Bear Stearns' assets onto the Fed's balance sheet. This Fed intervention, we could argue, then created the expectation among large financial institutions that the Fed was ready to intervene, and this may have led Lehman Brothers to forego actions that may have circumvented its bankruptcy in September 2008. The Lehman bankruptcy seems to have been critical in precipitating a systemic crisis. So, perhaps the Fed made key errors in the instance of Bear Stearns, which had important consequences later in the year. Another problem may have been excessive concern by the Fed concerning the solvency of money market mutual funds (MMMFs). These are institutions originally designed to - as much as possible - mimic the functions of commercial banks, without being subject to the same regulations. To the extent that MMMFs borrow short, lend long, and guarantee their creditors a nominal return of zero, they can be subject to the sames sorts of instabilities as commercial banks. But of course there is no deposit insurance for MMMFs, only the implicit insurance that came into play during the financial crisis, involving both the Fed and the Treasury. But why should the Fed care? MMMFs choose to operate outside of standard banking regulation, and MMMF shareholders should be able to understand the consequences of holding these uninsured shares. And the systemic consequences of a MMMF failure should be slight. Clearly the shareholders lose, but the assets are highly-liquid, and it seems easy for another financial institution to step in and pick up the pieces. If we think there is some fire sale phenomenon, that may give the central bank cause to intervene through temporary asset purchases, but why step in to save the MMMFs? For good or ill, Bernanke has helped drive a dramatic shift in how central bankers - not only in the Fed System but in the world - think about policy. The key post-crisis innovation in the U.S. was (is) an extended period with the short-term policy interest rate at close to zero. This has been combined with the payment of interest on reserves, an increase in the size of the Fed's balance sheet, a dramatic change in the composition of assets on the balance sheet, an increase in the use of forward guidance, and a change in the interpretation of the dual mandate. The Federal Open Market Committee at its meeting today decided to lower its target for the federal funds rate by 25 basis points to 3-3/4 percent. In a related action, the Board of Governors approved a 25 basis point reduction in the discount rate to 3-1/4 percent. Today's action by the FOMC brings the decline in the target federal funds rate since the beginning of the year to 275 basis points. The patterns evident in recent months--declining profitability and business capital spending, weak expansion of consumption, and slowing growth abroad--continue to weigh on the economy. The associated easing of pressures on labor and product markets is expected to keep inflation contained. If you have been reading recent FOMC statements, you'll first notice that the above is remarkably short by comparison. 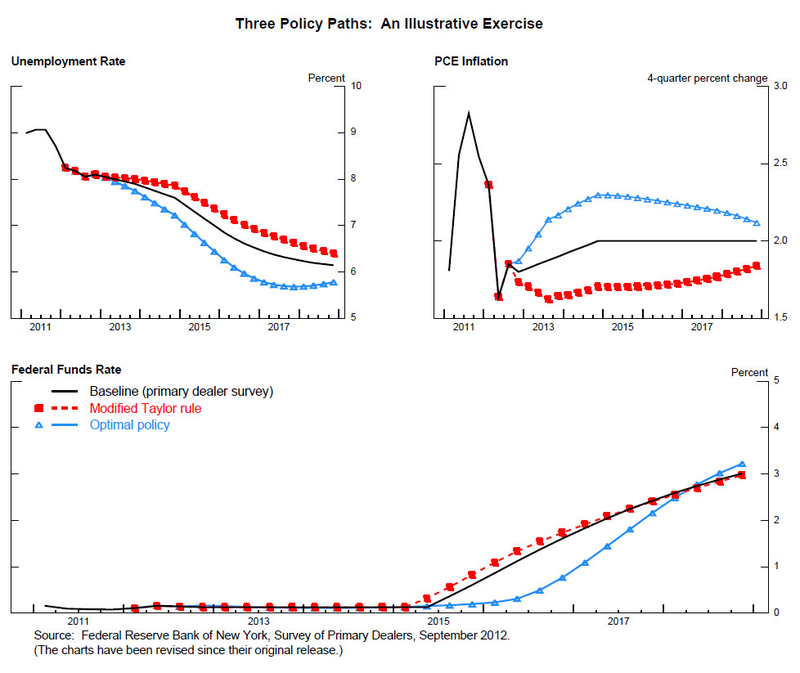 The policy action relates to only one policy variable - the target fed funds rate; there is only a brief description of the state of the economy; there is no attempt to explain why the Fed is taking the action it did - we're left to infer that the state of the economy had something to do with why the fed funds rate target was lowered; there is some vague attempt to address the dual mandate ("price stability and sustainable economic growth"), but no mention of what economic variables (e.g. pce inflation rate or unemployment rate) the Fed might be looking at; there is little forecast information, only mention of "risks"; there is no forward guidance, i.e. no information about contingent future actions. In light of what the Fed is now up to, we might think of the above FOMC statement as much less forthcoming than it should have been. But remember that, at the time, people were generally inclined to be calling Greenspan a genius. I can remember quibbles, but there was certainly no consensus that we were getting a bad deal from our friends at the Fed. But clearly, Bernanke and company thought that changes were necessary. With Bernankes's encouragement, the FOMC has become much more activist. The current FOMC participants are smart people, and they think they understand well how the world works, and are convinced they know how to make it work better. Greenspan did not know much, he knew he did not know much, and he had a very simple approach. He wanted to control inflation (implicitly, it seems, at about 2% per year), and was willing to reduce the fed funds rate in response to low aggregate economic activity. Whether Greenspan would have been better or worse than Bernanke over the last 8 years is an open question. The quotes in this article certainly make it seem that Greenspan is currently somewhat clueless. Bernanke clearly wins hands down in terms of his grasp of economics. But of course it's never clear in central banking that more knowledge, or more information, is always better. This paper by John Williams does a nice job of showing us the role that formal economics played in post-financial crisis monetary policy in the U.S. New Keynesian models were an important influence of course, and some of the work had already been done pre-financial crisis, for example by Eggertsson and Woodford, who were motivated by Japanese experience. This paper by Ivan Werning, which came out post-financial crisis, played an important role as well, as did Mike Woodford's 2012 Jackson Hole paper. To think about monetary policy at the zero lower bound on the short-term nominal interest rate, one first has to provide some justification for why it could be optimal for a central bank to choose zero as the overnight interest rate target. In the simplest New Keynesian models (Werning's for example), that's done by supposing that the representative agent's discount factor is high for some period of time. Then, the real interest rate should optimally be low, but at the zero lower bound the real interest rate is too high, given sticky prices. In this model, then, the central bank would like to ease more at the zero lower bound, but the only game in town is to make promises about future central bank actions. Further, those promises may not be time consistent, so commitment by the central bank is key to mabking the policy work. Bernanke's FOMC got into the business of making promises about the future in a big way. We're now all too familiar with the words "forward guidance." Initially, forward guidance took the form of "extended period" language, to the effect that the fed funds rate target was to remain low for an extended period of time. As the recovery from the last recession failed to proceed as well as expected, more explicit language was added to the FOMC statement about what "extended period" might mean, first in terms of calendar dates, and then as a threshold for the unemployment rate. In a New Keynesian model, it's clear how forward guidance works. The model will tell us when the central bank should choose a target short-term nominal interest rate of zero, when "liftoff" (departure from the zero lower bound) should occur, and what the nominal interest rate target should be away from the zero lower bound. All of those things are determined by the path followed by the exogenous shocks that hit the economy. In practice, we don't know how good the model is, we can't observe the shocks, and even if we believe the model it won't allow us to identify the shocks. So, forward guidance must be specified in some loose way, in terms of something we actually can observe. Ultimately, the FOMC chose the unemployment rate. So, what went wrong with forward guidance? If you had read Woodford's Jackson Hole paper in 2012, you might understand why we could be in for trouble. Mike can be long-winded, but if he takes close to 100 pages to tell you how forward guidance works, that can't be good. People have enough trouble understanding conventional central bank actions, let alone complicated, and evolving, statements about what may or may not happen in the future. First the Fed "committed" to the zero lower bound for a couple of years, then for another year. Then it "committed" to a threshold for the unemployment rate. What does that mean? Is the Fed going to do something when the unemployment rate reaches 6.5%? No, not necessarily. It seems there could be an extended period at the zero lower bound. So, ultimately, the FOMC came full circle on this. We're now back to extended period language, so all of those "commitments" were good for nothing. This points out the dangers of commitment, with respect to things that the Fed cannot control. Central banks can indeed control inflation, and the benefits of committing to stable inflation are well-understood. I thought it was also well-understood that the central bank's control over real variables - the unemployment rate for example - is transient. Also, there are so many factors other than monetary policy affecting real economic variables, that making promises about real economic activity is extremely dangerous for a central bank. If the FOMC has discovered those ideas again, this is not yet reflected in their policy statements. and all these other unconventional monetary policies, were you pretty confident that the theory would work or that whatever you -- going into it? In fact, a model in which QE does not work is the basic Woodford New Keynesian model. In a Woodford model, the only friction results from sticky prices (and maybe sticky wages). Otherwise, financial markets are complete, and there is nothing that would make particular kinds of asset swaps by the central bank matter. Indeed, baseline New Keynesian models leave the liabilities of the government and the central bank out of the analysis completely. So, in the context of post-financial crisis monetary policy, one model - the New Keynesian model - is being used to justify forward guidance, but it's going to have to be another model - if there is one - that justifies QE. That could be a problem, as we might like to know how those policy tools work together, or not. Absent a model, the Fed went ahead with QE anyway, supported by some ideas about how financial market segmentation might produce the desired result. Basically, if the market in Treasury securities is segmented by maturity, or if the market in mortgage-backed securities (MBS) is segmented from the market in Treasuries, then if the Fed purchases long Treasuries or MBS, the prices of these securities will rise, and their yields will fall. Then, the argument goes, declines in long bond yields will increase spending in exactly the way that reductions in the fed funds rate target would stimulate spending under conventional conditions. So, clearly, Bernanke thinks that, though the theory might be murky, it's obvious that QE works in practice. Well, hold on. For a summary of the evidence, see Williams's paper. The empirical evidence takes two forms - event studies and time series studies. Basically, what people find is that announcements of QE and actual QE purchases are associated with subsequent declines in nominal bond yields and changes in other asset prices. There are two problems with the interpretation of the evidence. The first is that, to confidently measure the effects of a particular policy, we need an explicit theory of how the policy works. Clearly, the relationship between the theory - such as it is - and the measurement is tenuous in this case. Second, it is possible that QE could move asset prices - in exactly the way posited by Ben Bernanke - even if QE is actually irrelevant. Suppose a world where QE is irrelevant, and everyone knows it. Then, of course QE will not make any difference for asset prices - or anything else. But suppose in the same world that the central bank thinks that QE works, and financial market participants believe the central bank. Then QE will in fact cause asset prices to move as the central bank says they will, at least until everyone learns what is going on. Models like that are going to be very difficult to work out, but that could well be part of what we are dealing with. Given that Bernanke and the other members of the FOMC had little idea what QE might actually do in practice, how did they go about determining the magnitude of the interventions? For example QE2 was planned as $75 billion in purchases of long-maturity Treasuries over 8 months, and the current program was an open-ended purchase of $85 billion in long Treasuries and MBS per month. Obviously some judgement was made that $75-$85 billion per month in purchases was about right. Why? This paper by Chung et al. gives us some clues, I think (note that John Williams is a coauthor). The important part of the paper is section VI, beginning on page 21. There is an exercise in which the quantitative effects of QE are measured. The basic idea is to take the Fed's FRB/US model as a starting point. In that model, we can conduct policy experiments such as changing the future path for the fed funds rate, and determining how that matters. But, as far as I can tell, one cannot conduct experiments in that model to determine how changes in the composition of the Fed's balance sheet matters. Certainly that model will not tell us the difference between a long-maturity Treasury security and a MBS. So, what is done is to translate a given quantity of asset purchases into a given change in the fed funds rate, by making use of the available "empirical evidence," and then doing the experiment as a change in the path for the fed funds rate. What's wrong with that? Plenty. (i) We should not take seriously what the FRB/US model tells us about conventional monetary policy, let along unconventional policy. What is in the FRB/US model is for the most part a secret - for no good reason - from the outside world. But we can make some guesses, based on what little documentation is in the public domain. The model is basically a dressed-up version of the types of macroeconometric models that were first built in the 1960s. Indeed, the FRB/US model is descended from the FRB/MIT/Penn model - a late-1960s-vintage macroeconometric model comprising several hundred equations - basically expanded IS/LM. Lucas and Sims were pretty convincing, I thought, when they told us we should not believe the policy experiments that were conducted using such models. My best guess is that there is nothing in the current version of the FRB/US model that would change our minds about the policy relevance of large macroeconometric models. To back that statement up, consider an example of how the FRB/US model does in practice, which comes from a speech by Janet Yellen in November 2012. In the chart, focus on the "optimal" policy, which we'll assume was close to what was actually implemented (which seems about right given current forward guidance). 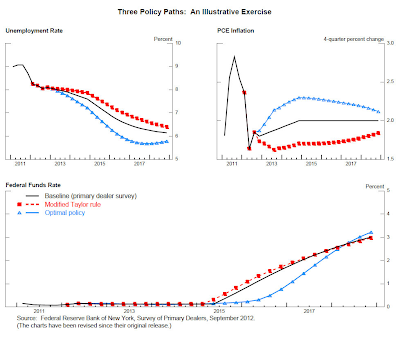 This is a policy exercise conducted using the FRB/US model, assuming a quadratic loss function for inflation and the unemployment rate, with equal weights on the two squared deviations from the "optimal" values ("optimal" is 2% for inflation, and 5% for the unemployment rate). You can see that the model missed by a lot - on the high side for both inflation and the unemployment rate. So, whatever is currently going on in the U.S. economy, the FRB/US model does not capture it very well. And I don't think this is because of anything unexpected that happened in the last year. (ii) There may be aspects of QE that work in quite different ways from conventional monetary policy. There is no good reason to think that swapping outside money for T-bills (effectively what happens under conventional conditions) is somehow the same as changing the maturity structure of the outstanding consolidated government debt. Indeed, in the model I wrote down, QE has some very different effects from conventional monetary policy. Ultimately, though, QE in itself is not a big concern. Either it works or it doesn't, and if it doesn't work, there is no direct harm. There is no good reason to think that QE is inherently inflationary. For example, in the model I mentioned above, the long-run effect of QE is to lower inflation. Why? In the model I worked with, QE acts to substitute good collateral for less-good collateral, which relaxes incentive constraints, and lowers the liquidity premium on safe collateral. Real bond yields rise and, given a fixed short-term nominal interest rate (zero, say), inflation must fall. As well, the size of the Fed's balance sheet is not a concern. For example if the Fed expanded its balance sheet by issuing interest bearing reserves to purchase T-bills, we shouldn't be worried. Finally, even though the Fed is now borrowing short and lending long, in a massive way, we should not care if, in the future, the Fed starts earning negative profits. Economically, that does not matter. So what has Ben Bernanke left us with? Primarily, I think, the Fed is confused about what it is supposed to be doing, and I think the public is confused about what it should be expecting from the Fed. It's fine to experiment, and everyone understands that the human race would get nowhere without experimentation. But when the Fed experiments it would be nice if there were some inclination within the organization to cast a critical eye on the experiments. I think it's clear that forward guidance has been a bust, and I think careful a priori thinking would have headed that off. The forward guidance experiment failed for reasons that were obvious at the outset. With QE, I think the jury is still out. Whether this has quantitatively significant effects or not, a key question is whether it is appropriate for the central bank to be engaging in debt management, which has traditionally been the province of the fiscal authority. Indeed, while QE was taking place, with the Fed acting to reduce the duration of the outstanding consolidated government debt, the Treasury was issuing debt with a longer average duration. It seems certain that, once QE is phased out, the Fed will claim that these programs were a success, and put QE away in the box of good tools, for later use. If the maturity structure of the outstanding consolidated government debt is so important, then there should be a public discussion of who is to determine it. If it's determined that the Fed should be managing the government debt, then the Federal Reserve Act should be amended to accommodate those responsibilities. Finally, perhaps the most important lasting change in policy that comes out of the Bernanke era is a greater tendency of the Fed to focus on short-run goals rather than long-run goals. Indeed, the Fed's concern with the state of the labor market seems to have evolved into a belief that the Fed can have long-run effects on labor force participation and the employment/population ratio. That belief appears to be unsupported by theory or empirical evidence. Further, FOMC members do not appear to understand that two or three more years with the Fed's policy interest rate close to the zero lower bound will not help to fix whatever ails the labor market, nor will it increase the inflation rate. If the Fed falls well short of its 2% inflation goal for some period of time, it's not obvious that would be so harmful, but at the minimum it harms the Fed's credibility. Some commenters have asked if there are books written by frontline macroeconomic researchers that make modern macro accessible for lay people. There is a new one out by Kartik Athreya at the Richmond Fed that is good reading. Excellent interview with John Cochrane by the Richmond Fed, covering financial regulation, QE, and the relationship between monetary and fiscal policy, among other things. Dale Mortensen passed away last night at the age of 74. Dale's first published paper was a contribution to the Phelps volume, which helped create a revolution in how economists think about the labor market, and about macroeconomics. Dale's contributions to the economics of search, including work in collaboration with Chris Pissarides, now forms an integral part of modern labor economics and macroeconomics. Dale, with Chris Pissarides and Peter Diamond, won the Nobel Prize in Economics in 2010. 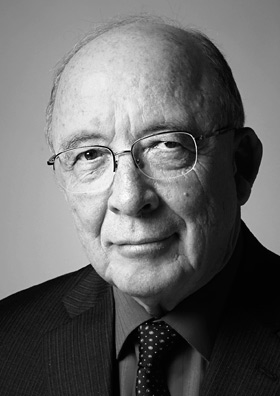 Dale was a founding member of the Society for Economic Dynamics, served as its President from 1996-2000, and did a lot to move the organization forward. For more biographical details, you can read Dale's own words. I last saw Dale in September of this year at a meeting of the Search and Matching group at the Philly Fed. He presented a nice paper, and was very much engaged in the conference - very sharp, following the details, and asking questions when he didn't quite get it. A great mind, and a superb economist. In macroeconomics, the intellectual challenge is every bit as great as it is in other fields that have unsolved problems. The economy is a gigantic system with billions of human decisions made every day. Furthermore, people look to the future and try to predict the behavior of the system as they make their decisions today. How are all these decisions being made? How are people reacting to the market forces around them and to the changes in the environment around them? How can we effectively summarize their behavior at an aggregate level? How is policy interacting with all those decisions? These are not questions that can be addressed with a wave of the hand, a clever speech or a witty blog posting. There is just no substitute for heavy technical analysis—plenty of math and statistics combined with plenty of computing power and plenty of intellectual creativity—to get to the bottom of these issues. We might as well admit that progress in attaining satisfactory answers is going to be slow, but still this is the only reasonable course to make progress. Excellent. A policymaker who understands that there is a lot we don't know, and that it's going to be hard slogging to improve on what knowledge we already have - or think we have. But he also seems to know where to look to get answers, and has respect for the economists doing the heavy lifting. For all of the young economists at the ASSA meetings looking for work, take note. This is the type of person you want to have in charge of the place where you plan on setting up shop. For further reading, Bullard's piece is a synopsis from an interview for the Economic Dynamics newsletter.